Newly awakened from a five-month hibernation, NASA’s New Horizons spacecraft may visit a third Kuiper Belt Object (KBO) after flying by 2014 MU69 on Jan. 1, 2019. 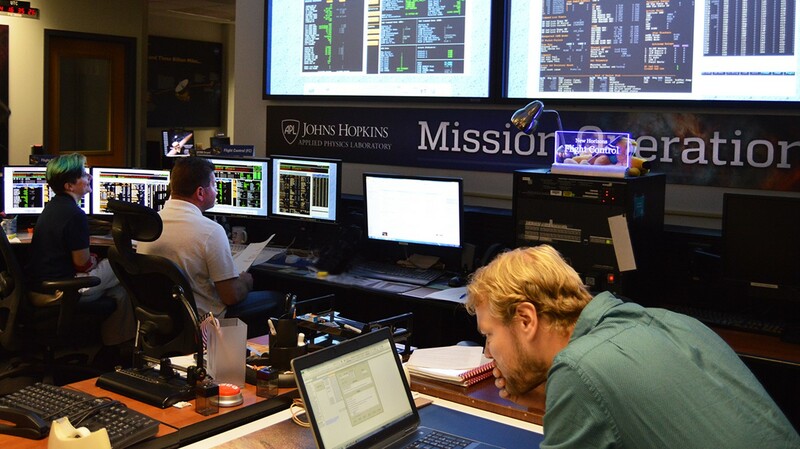 Mission scientists at the Johns Hopkins University Applied Physics Laboratory (JHUAPL) received confirmation from NASA’s Deep Space Network in Madrid, Spain, that the probe exited hibernation mode on Monday, Sept. 11, 2017. For the next three months, the mission operations team will conduct checks of the spacecraft’s science instruments and data collection activities. In a normal condition with all its instruments functioning, New Horizons is now 3.6 billion miles (5.8 billion kilometers) from Earth. Radio signals take approximately 5 hours, 24 minutes each way between Earth and the probe. This most recent hibernation was the first since the spacecraft flew by Pluto in July 2015 and sent back all the data it collected on the Pluto system for the next 16 months. The spacecraft is now about 369 million miles (593 million kilometers), or four times the Earth-Sun distance, from its second target. Using its Long Range Reconnaissance Imager (LORRI), New Horizons will observe numerous KBOs, including several dwarf planets, as well as centaurs – objects that appear to be hybrids of asteroids and comets – from a distance during the next few months. Additionally, it will study gas, dust, and radiation in the environment as it travels through the Kuiper Belt. New software will be uploaded to the probe’s computers in October in preparation for the MU69 flyby while the mission operations and science teams will plan the details of the probe’s trajectory. A course correction maneuver aimed at setting the exact flyby time will be conducted on Dec. 9, 2017. Observations of the distant KBO when it occulted three different stars in June and July of 2017 showed it to be more complex than expected but also indicate that New Horizons may be able to save enough fuel during the flyby to reach a third target should another mission extension be approved. Before the occultations, little was known about MU69, discovered only three years ago with the Hubble Space Telescope, other than its brightness and color. The KBO is believed to be at most 31 miles (50 kilometers) in diameter. When they observed the third occultation with portable telescopes from Patagonia, Argentina, mission scientists were surprised to find MU69 to be either a double-lobed object or a binary system of two objects closely orbiting one another. One particular finding – a lack of variation in MU69’s brightness as it rotates – could result in New Horizons not needing to adjust its path during the flyby, resulting in less fuel being used. Stern said that the lack of brightness variation either means the object is not presenting vastly different cross-sections to us as it rotates or telescopes are looking down the barrel of the rotation axis. 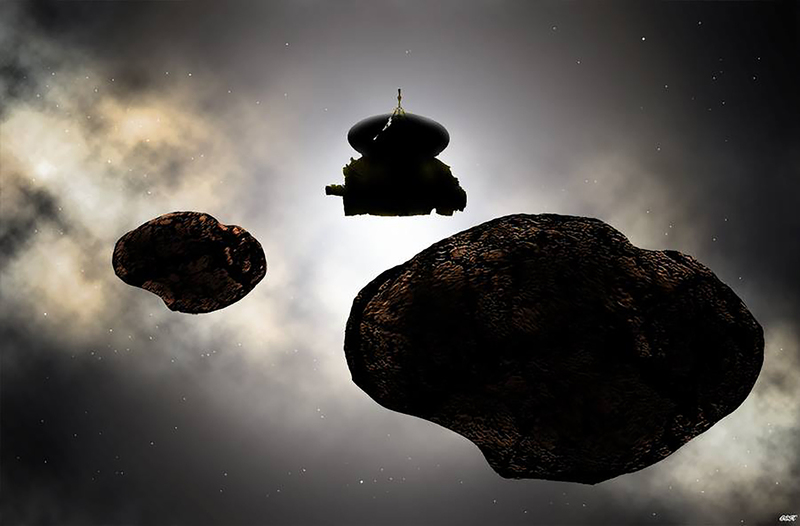 Fuel saved during the MU69 encounter could be used to send New Horizons to a third KBO, a move that would require yet another mission extension. In 2016, NASA approved an extended mission for the MU69 flyby through the year 2021. On Sept. 6, Stern told members of NASA’s Outer Planets Assessment Group that mission scientists are already searching for an additional KBO target. “We have a fighting chance of having a second [Kuiper Belt Object] flyby,” Stern said. Approval of another mission extension will also provide more opportunities for New Horizons to continue its distant observations of KBOs, dwarf planets, and centaurs. Stern said that he intends to request a second extension once the MU69 flyby is completed and the data collected from it returned to Earth. Even that might not be the mission’s end. Stern foresees additional extensions beyond the one that would take it to a second KBO. The probe will be put into another hibernation period on Dec. 22, 2017, during which it will remain until June 4, 2018, when it will be woken up in preparation for the MU69 encounter, which will officially begin in August 2018.